Have you ever wished that students were eating healthier lunches? Now you can display or distribute a flyer to inform them about how they can participate in the Healthy Lunchtime Challenge. 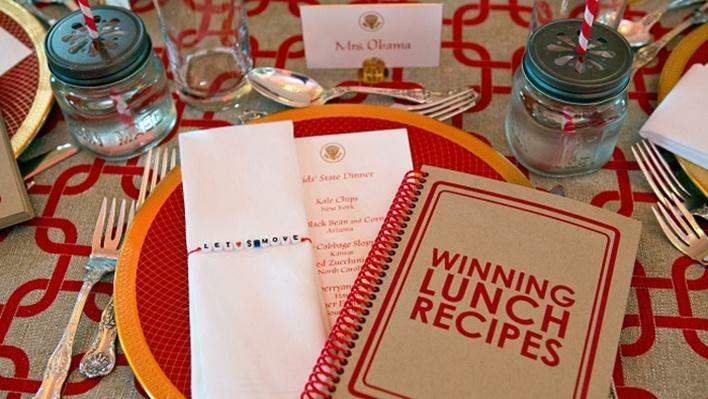 Kids ages 8-12 can create and submit a healthy recipe and possibly win a trip to the 2015 Kids’ “State Dinner” at the White House! WGBH is teaming up with First Lady Michelle Obama, the U.S. Department of Education, and the U.S. Department of Agriculture to host this fourth annual Healthy Lunchtime Challenge for kids to join a parent or guardian in creating an original recipe that could be served at The White House this summer. You’ll find the flyer along with related resources at PBS LearningMedia’s new Healthy Eating Collection. You can also view a video of Michelle Obama talking about the challenge. This entry was posted in Lesson Plans, Parent Resources, PBS Resources, Teaching Tools. Bookmark the permalink.